President: Joseph W. “Joe” McKinney Vice President: Cecilia Schneider-Vial Treasurer: Gary Wilson Secretary: Peggy Misch Board of Directors: Barry Atchison, Scott Aylor, Jane Brookins, Richard Deardoff, Jim Flanagan, Helen Geisler, Eugene Hankinson, , Jack Maher, and Tony Seidita. Christ Episcopal Church, Brandy Station and the Brandy Station Foundation are pleased to announce that the 4th Annual Commemorative Church Service will be held at the site of the destroyed St. James Church on the battlefield at Brandy Station on Sunday, June 10h at 9:30AM. We will gather beginning at 9:00 AM.. Rev. Peter Way will officiate. The community is invited to participate in this recreation of a 1860's service of Holy Eucharist. It will be an especially moving service in this first year of the Civil War Sesquicentennial. The service will be outside at the location of the small Episcopal church which was totally dismantled during the encampment of Union troops in the winter 1863-64. The site continues to be owned by its descendant church, Christ Episcopal of Brandy Station and the Brandy Station Foundation is the steward of the 2 acre property in the midst of the largest cavalry battle of North America. All are then invited after the service to the Graffiti House o 19484 Brandy Road in Brandy Station for refreshments. 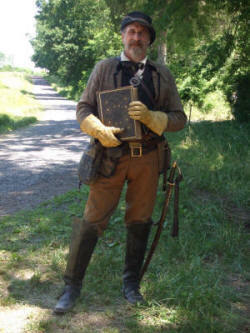 Below: Alongside St. James Church Road in Brandy Station, re-enactor Stephen Dunn holds the Bible from St. James Church which was stolen by Union troops and later returned. It is asked that those attending park their cars at the designated Civil War Trust parking circle at the intersection of Beverly Ford Rd. and St James Church Rd. This is just yards before the entrance into the airport. It is a short walk down the road to the site entrance and then a shorter path leads us through the woods to the site of the church. . We will have some chairs available for seating during the service but we recommend that you bring a folding lawn chair if possible. Drivers for handicapped persons may drop them off at the entrance to the woods and then remove the auto to the parking circle area. It is also suggested that you prepare for the woods with closed shoes and bug repellant. Back row, from left: Cecilia Schneider-Vial, Tony Seidita, Barry Atchison, Jack Maher, Dan Beattie, Bob Luddy, Bob Jones. Front row, from left: Jane Brookins, Richard Deardoff, Peggy Misch, Joe McKinney, Eugene Hankinson, Helen Geisler, Scott Aylor, and Steve Sylvia. 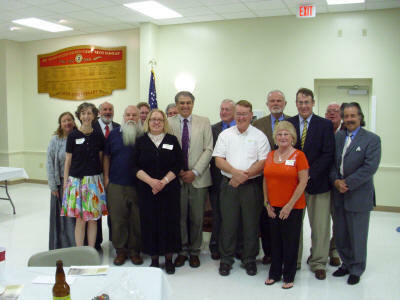 At the Brandy Station Foundation Annual Dinner and meeting on April 20, 2012, the following Board of Directors and Advisory Committee were elected: President, Joseph W. (Joe) McKinney, Vice-President, M. Cecilia Schneider-Vial, Treasurer, Gary Wilson, and Secretary, Peggy Misch. The Board of Directors elected include: Barry Atchison, Dr. Scott Aylor, Jane Brookins, Richard Deardoff, Jim Flanagan, Helen Geisler, Eugene Hankinson, Jack Maher, and Anthony (Tony) Seidita. The Brandy Station Advisory Committee includes Dr. Daniel Beattie, Edwin F. (Ed) Gentry, Robert L. (Bob) Jones, Robert Kenefick, Steve Sylvia, and Dr. John R. Tole. 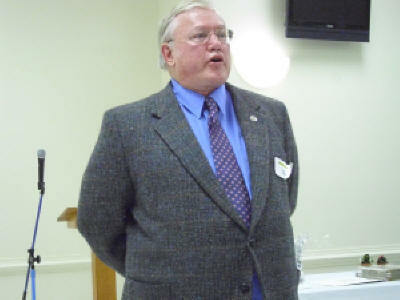 Dr. Daniel Beattie was the featured speaker at the BSF Annual Dinner. His topic was 'If You Want to Have Fun, J'ine the Cavalry': What Cavalry Really Did in the Civil War. 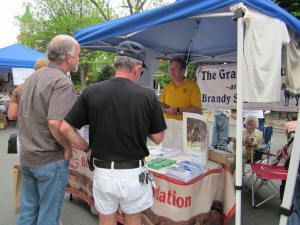 He also signed copies of his recent book published by Osprey: Brandy Station, 1863: First Step Towards Gettysburg. The Brandy Station Foundation would like to announce an exciting and fun ball to commemorate the Battle of Kelly’s Ford which occurred on March 17, 1863. The music will be provided by the well known period musical group 2nd South Carolina Band. The dress is black tie and period dress is optional. There will be Silent Auction items and prizes. The location will be The Inn at Kelly's Ford, 16589 Edwards Shop Road, Remington, Virginia 22734 The phone number for reservations for accommodations at the Inn is 540-399-1779. The Culpeper Tourism site also has information about accommodations: http://www.visitculpeperva.com/. Our friends at the Rogers Ford Winery in Sumerduck, Virginia, have a sherry sporting a Battle of Brandy Station label. The winery website indicates that they produce “wine handcrafted in the style of Old-World artisan wineries”. The winery is located in Fauquier County at 14672 Rogers Ford Road, Sumerduck, VA 22742; phone 540-439-3707. The tasting room is open from 11-5, Friday-Monday, March - December. First I would like to encourage you all to visit the BSF website, www.brandystationfoundation.com, and review our 2011 Annual Report. (Click on the tab “About Us” and then click on “Annual Reports.”) This year we have attempted to lay out in greater detail the activities and financial status of the BSF. It is our intent to try and keep you fully informed, and we hope that you find the report interesting. We also hope that you agree that we have done a good job of husbanding the BSF’s resources during the past year. If you have any questions or comments, please send them directly to me via email. There is a link at the “Contact Us” tab on website. I am pleased to announce that last month the BSF, working with concerned Culpeper residents and other preservation/environmental groups, defeated an application by a local business to build and operate a biosolids storage facility on the Rappahannock Station I battlefield. We have no issue with the agricultural use of biosolids by local farmers and landowners; however, we considered the proposed storage & distribution facility to be totally inconsistent with the strategic goals of our foundation. In our view, had the application been approved, the site of the opening battle of the Second Manassas Campaign would have been irreparably harmed. We are gratified that the Culpeper Board of Supervisors, after lengthy hearings on the matter, voted to deny the application. As may of you know, we held our annual meeting on April 20. I am personally honored that the members present approved my nomination to continue as your president for a second year. I am very pleased that the members also approved a slate of highly capable, hard working officers and board members. I pledge to each of you that we will do our best to further the interests of the Brandy Station Foundation through the coming year. 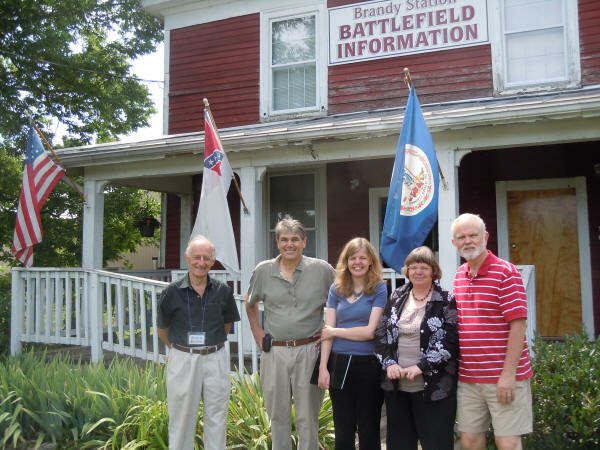 The BSF is presenting a series of two-hour tours, one devoted to each of the four engagements that comprise the Battle of Brandy Station on June 9, 1863. Transportation: Personal vehicle caravan will depart from the Graffiti House at 10AM. The cost is $10 (children under 12 are free). Tours leave from the Graffiti House at 10:00 am and last 2 hours. No reservations are needed, please arrive at the Graffiti House before ten. Special tours for individuals or groups on other days can be specially arranged. The Brandy Station Foundation Sunday lecture series began again this April. The lectures series runs on one Sunday of each month from Aril through October and begin at 2:00 PM. Everyone is welcome, the lectures are free (although donations are welcome), and free refreshments are provided by BSF board members and friends. Sunday, July 29, 2 PM: The Potomac Frontier: The Mosby Heritage Area in the Winter of 1861-1862 - The emphasis here is on the variety of experiences people in our region had from October 1861 through the spring of 1862. Richard Gillespie was an award winning social studies teacher for 30 years with Loudoun County Public Schools before retiring to be the Director of Education for the Mosby Heritage Area Association. Sunday, August 26, 2 PM: The Campaign of Second Manassas - On it's 150th Anniversary, the campaign described as Lee's finest will be discussed. Battles include not only Manassas, but Cedar Mountain in Culpeper and Chantilly in Fairfax. The destruction of the latter battlefield to construct Fair Oaks Shopping Mall led directly to current preservations efforts. Tim Nosal is a former park ranger at Manassas, has been on active duty in the Middle East and is currently the Chief of Media Relations and Outreach for the American Battle Monuments Commission. Sunday, October 28, 2 PM : Small Arms of the Civil War - Using 18 quality original Civil War muskets and carbines, the arms available to the U.S. Army at the beginning of the conflict will be discussed, as well as primary Federal and Confederate arms alteration and production during the War, acquisition and import of arms to both sides, some of the agents of both, financing and examples of the major Confederate and small arms ammunition plants, as well as the tactical issues improved and modernized arms created for the commanders and soldiers. Lon Lacey is on the Board of Directors of the Friends of Cedar Mountain Battlefield and volunteers for the Brandy Station Foundation. 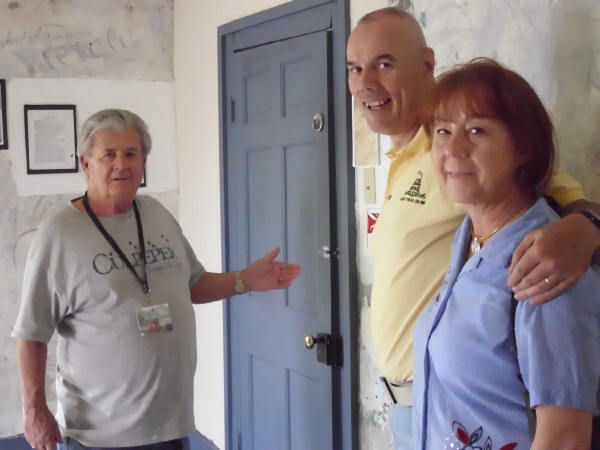 Janet Reed, and BSF volunteer and former President Bob Luddy at the Graffiti House in June, 2011. It all began last summer, when the Graffiti House owned by the Brandy Station Foundation was visited by a University of Manchester (England) student, Katherine Reed, who was doing a thesis on American Civil War Graffiti. She had traveled to America with her mother, Janet, and the two of them were visiting graffiti sites that they had located on the internet. At Brandy Station, Joe McKinney, Geoffrey Hazzan and Bob Luddy provided a background of facts and figures supplemented by pictures and stories concerning the Graffiti House graffiti and its origins. During Katherine’s visit, she toured the Graffiti House, Blenheim, the Old Court House Museum and other sites in the northern Virginia area. She consequently wrote her paper - and indicated that she had identified about 25 sites in Virginia that possessed graffiti. Upon receiving a copy of Katherine’s thesis, Bob Luddy, a former president of the Brandy Station Foundation, proposed that the BSF partner with other near-by sites to form a “graffiti trail.” The BSF Board of Directors enthusiastically endorsed this concept, and Bob then approached Andrea Loewenwarter at Blenheim in Fairfax and discussed the idea with her. She indicated that the same concept had occurred to her also! Using Andrea's contacts, they contacted several locations identified by Katherine, put together a working group to further discuss and define what was next to do, and did it! The (initial) product is now done - the Northern Virginia Graffiti Trail brochure, posted on www.brandystationfoundation.com. If all goes well, it is possible that the number of trail sites may be expanded in the future or possibly a bus tour to follow the trail could be arranged. BSF Board Member Jack Maher. The weekend of April 13 to April 16 was Remembrance Days weekend in Culpeper County. Local and out of town visitors used the occasion to visit the Graffiti House. The Brandy Station Foundation participated with a “mega” tour of Fleetwood Hill by BSF President Joe McKinney, and a lecture by Joe at the Graffiti House, “Raising Confederate Cavalry”. In this presentation, Joe described how in a matter of months the Confederacy recruited, organized, trained, and equipped cavalry forces that for the first two years of the Civil War were clearly superior to their better-equipped Union adversaries. The Brandy Station Foundation hosted national Park Day on March 31st at three Culpeper County sites: Kelly’s Ford (site of the Battle of Kelly’s Ford on March 17, 1863 and an engagement of the Battle of Brandy Station on June 9, 1863); the nearby monument to the gallant John Pelham; and, the Graffiti House. 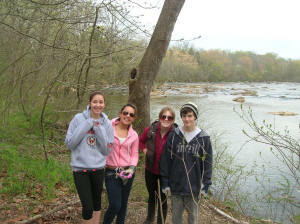 At left at Kelly’s Ford are volunteers led by BSF Board member Richard Deardoff and his students from Kettle Run High School in Fauquier County. On March 3, members of Transcend Paranormal from Richmond shared the results of research in January 2012 and June 2011 as well as the equipment they use with BSF Board members and Graffiti House visitors. Equipment includes digital recorders, EVP recorders, ultraviolet and infrared cameras, thermometers, EMF detectors, etc. 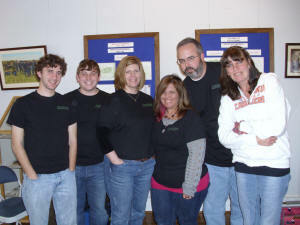 Transcend Paranormal group includes Zak Haefling, Steve Dills, Rebecca and Thom Mattauch, Missy Sykes, and Rhonda Montgomery. Brandy Station Foundation Board members Barry Atchison, Jack Maher, and Cecilia Schneider-Vial set up a Brandy Station Foundation tent and display at Culpeper Day in downtown Culpeper on May 5th. Davis Street becomes a pedestrian walkway for displays of crafts, food, and community group sharing their literature and their passions. 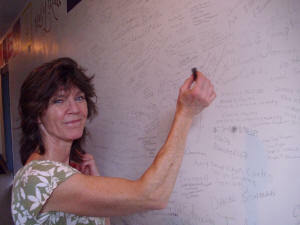 On April 21, during Remembrance Days weekend, Kerry Goddin Kohler of Warrenton signed the Hall of Honor at the Graffiti House. She is a descendent of Valentine Brown, 1st Virginia Cavalry, Purcell’s Battery, and, John Robert Jones, Brig. General of the 33rd Virginia Infantry (Lee’s Lieutenants) . Please enroll me as a member of the Foundation.